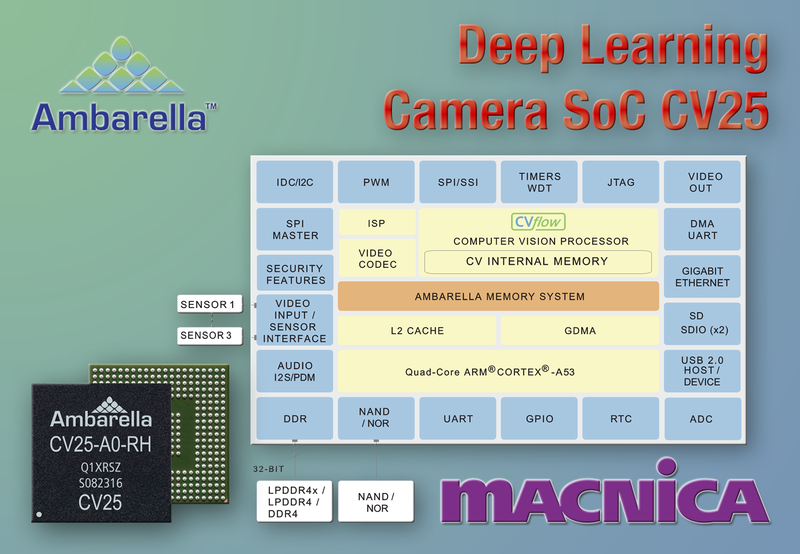 SANTA CLARA, Calif., Jan 7, 2019 — Ambarella, Inc. (NASDAQ: AMBA) a leading developer of high-resolution video processing and computer vision semiconduc-tors, today introduced the CV25 camera System-on-Chip (SoC), the latest in the CVflow family, combining advanced image processing, high-resolution video encoding and CVflow computer vision processing in a single, extremely low power design. The CV25’s CVflow architecture provides the Deep Neural Network (DNN) pro-cessing required for the next generation of affordable and intelligent home monitor-ing, professional surveillance, and aftermarket automotive solutions, including smart dash-cameras, Driver Monitoring Systems (DMS), and electronic mirrors. AI applications enabled at the edge include person recognition and the ability to dis-tinguish between pets, persons, and vehicles. In smart video doorbells, CV25 can automatically recognize familiar faces approaching the front door, flag unknown persons, and alert the homeowner when a package is delivered. In driver monitoring systems, it can detect a driver’s drowsiness or level of distraction by monitoring their eyes and facial expressions. CV25 delivers efficient video encoding in both AVC and HEVC formats with very low bitrates to minimize cloud storage costs. A high-performance Image Signal Pro-cessor (ISP) delivers outstanding imaging in low light conditions, and High Dynamic Range (HDR) processing extracts maximum image detail in high-contrast scenes. It includes a full suite of advanced cyber-security features to protect against hacking in-cluding secure boot, TrustZone™, and I/O virtualization. Based on 10nm ultra-low power process technology, the CV25 chip is optimized for wire-free camera applications that require long battery life and small form factors. As part of the CVflow family, the CV25 chip shares a common SDK, Computer Vi-sion (CV) tools, ISP, and cyber-security features with the existing CV22 and CV2 SoCs, allowing multiple price-performance options. Ambarella’s complete set of CV tools helps customers easily port their own neural networks onto CV25. The set includes a compiler, debugger, and support for industry-standard machine learning frameworks such as Caffe™ and TensorFlow™, with extensive guidelines for Convo-lutional Neural Networks (CNN) performance optimizations. Information about Pricing and availability info via email: sales.europe@macnica.com. Ambarella’s products are used in a wide variety of human and computer vision applications, including surveillance, Advanced Driver Assistance Systems (ADAS), electronic mirror, drive recorder, driver/cabin monitoring, autonomous driving, and robotic applications. Ambarella’s low-power and high-resolution video compression, image processing, and deep neural network processors and software enable cameras to become more intelligent by extracting valuable data from high-resolution video streams. For more information, please visit www.ambarella.com. All brand names, product names, or trademarks belong to their respective holders. Ambarella reserves the right to alter product and service offerings, specifications and pricing at any time without notice. © 2019 Ambarella. All rights reserved. Copyright 2019 Macnica UK Ltd.